When we lived in Portland we became huge fans of Vietnamese food. I have to say it is my favorite type of Asian food! And I love pretty much all types of Asian food… but there is something about Vietnamese food that is so FRESH. It’s filling but light and just so dang flavorful. My husband used to regularly bring home food from Luc Lac – and we would devour it. We haven’t found a Vietnamese restaurant we love here in Texas (any recommendations?) so I’ve been cooking up some different types to find a recipe I loved. 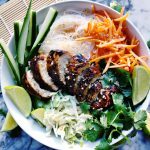 These Vietnamese Lemongrass Chicken and Noodle Bowls made me want to face plant into the bowl! The chicken is bursting with light lemongrass fragrance and the sauce is just so fresh and flavorful. I also love that there’s no oil in the sauce! Much lighter on calories. And vermicelli noodles are light but oh so sticky. Light and fresh with so much flavor. These bowls are amazing. 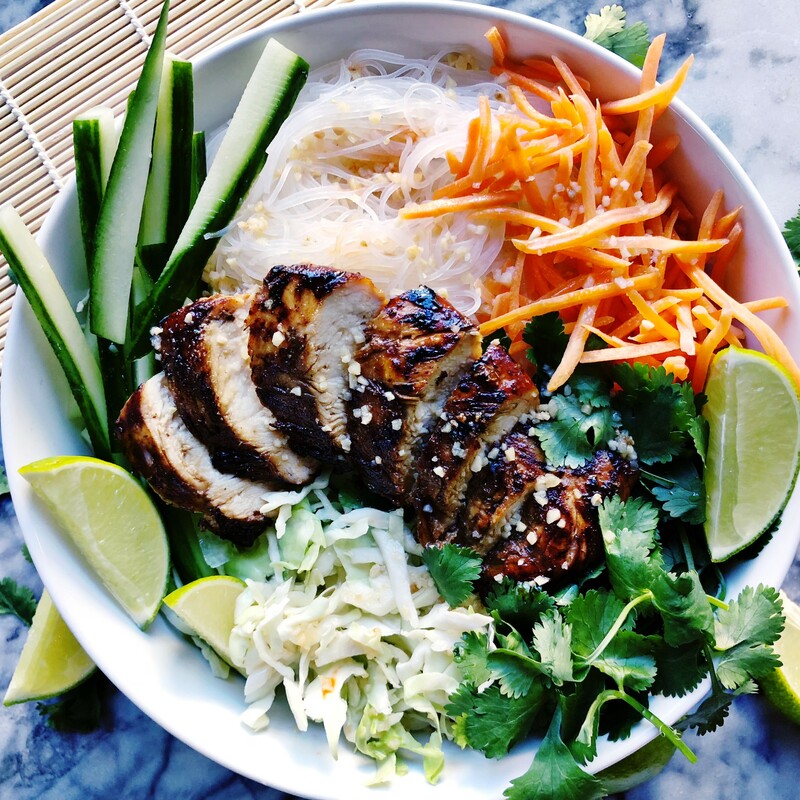 Adapted from Recipe Tin Eats Vietnamese Chicken Bowls! Combine meat and marinade ingredients and set aside for at least 1 hour, up to 1 day in the fridge. Heat 1 tbsp. of oil in a cast iron pan or skillet over medium high heat. Remove chicken from marinade, removing pieces of lemongrass. Place chicken onto searing hot pan and cook for 4-5 minutes on each side. Once cooked through, set aside to rest before cutting. Fill one side of the bowl with 1/2 of the shredded lettuce or cabbage. Fill the other side with half of the rice noodles. Repeat for 2nd bowl. 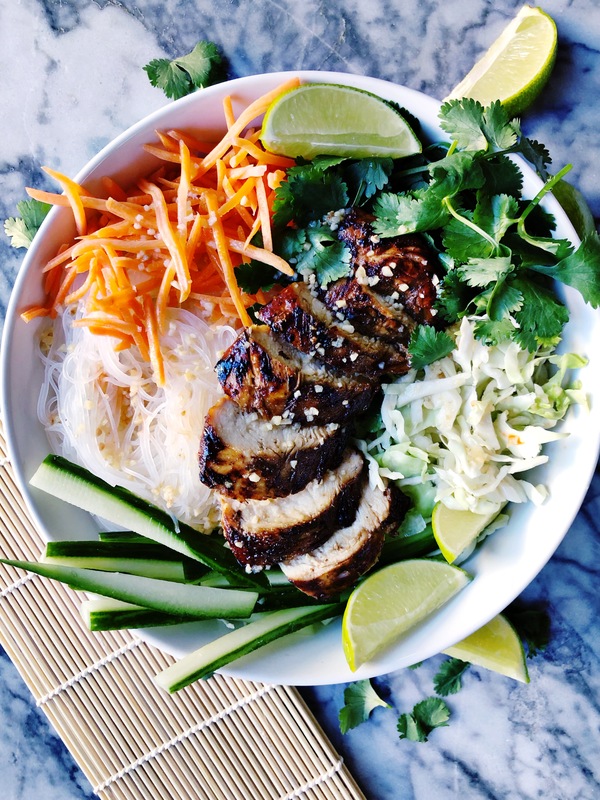 Top noodles and lettuce with carrots, cucumber, cilantro, limes and chicken. Split dressing between 2 bowls, and dress well. The bowl tastes great covered in sauce! Garnish with a squeeze of fresh lime juice and extra cilantro (or sriracha if you like a little heat). Mix together and enjoy! 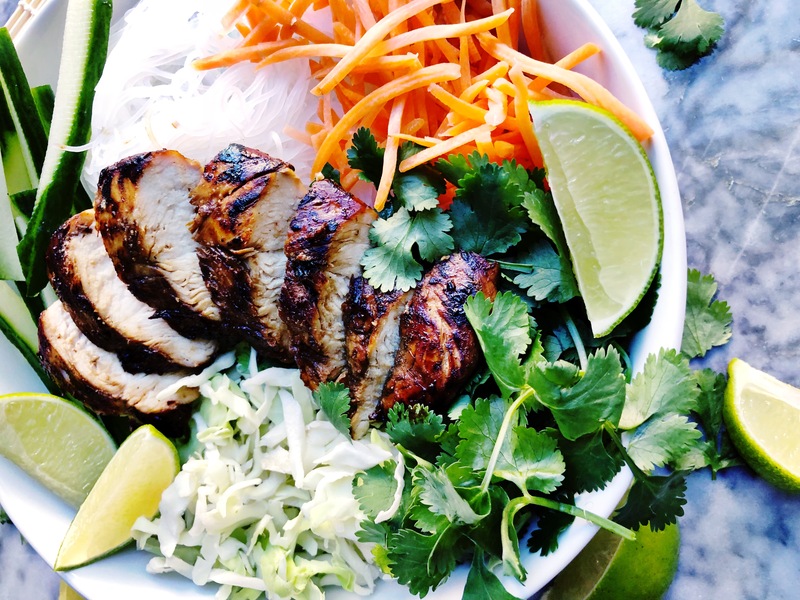 The best part of these Vietnamese Lemongrass Chicken and Noodle Bowls? The SAUCE! Slather it on. If you are trying to eat healthy (or even if you aren’t! ), I know you’ll love these bowls! Check out all my clean recipes here and my global recipes here. 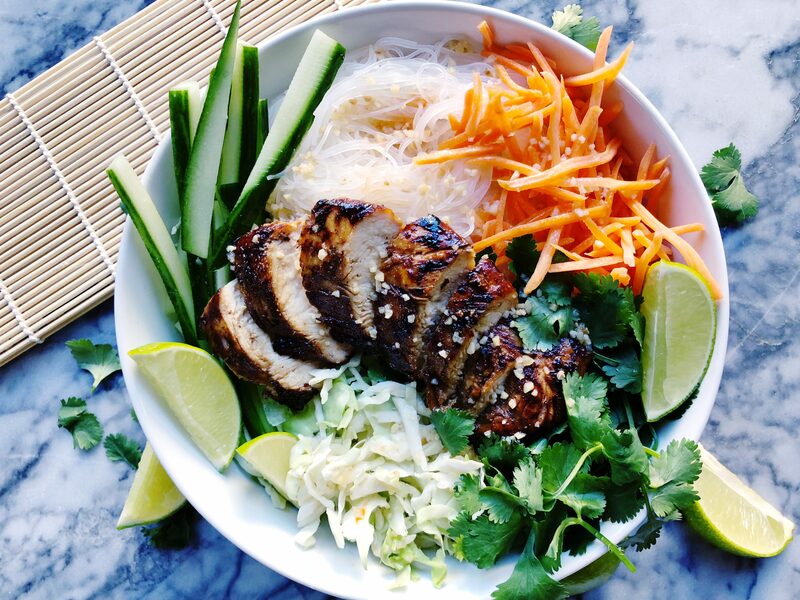 Be sure to tag me if you make these Vietnamese Lemongrass Chicken and Noodle Bowls at @plumstreetcollective on Instagram. My mouth is watering!!! Yum! I just tried Vietnamese food the other day for lunch, I know what you mean about light and flavorful. Absolutely delicious!! I will give this recipe a try. Yes, it’s the best! Hope you love it. ps, just checked out your site and love your photography! 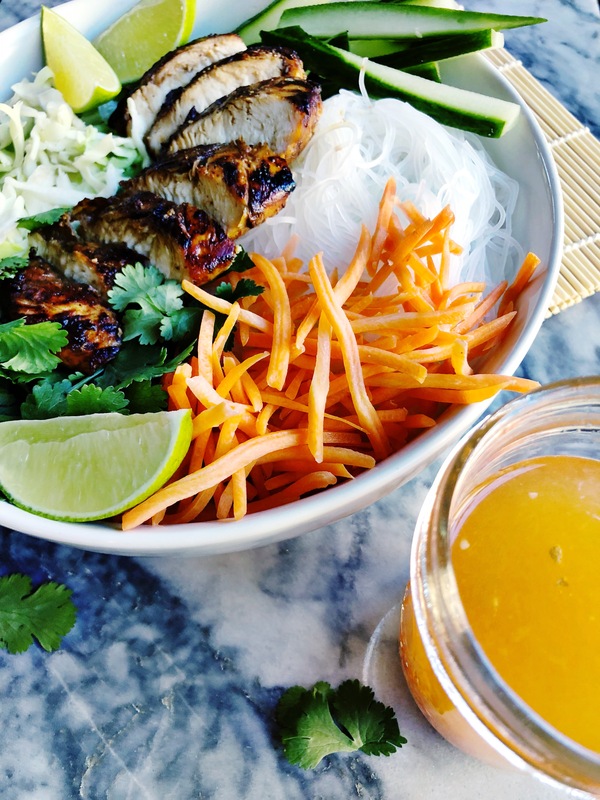 Do you know of a good substitute for fish sauce? I’ve heard you can use soy sauce with a little lime juice in it, but I haven’t tried it!